We at Biomedica understand the importance of high quality, well validated research products. We optimize all Biomedica products for reliability, sensitivity, precision, and ease-of-use. We validate our kits extensively according to FDA, EMA and ICH guidelines. Our development, production and customer service teams consist of doctorate-level and industry-trained scientists with long-standing research experience. 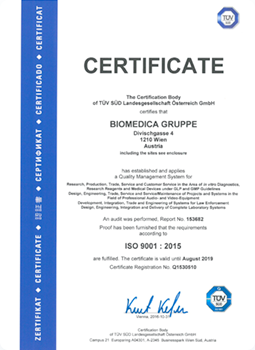 Biomedica’s manufacturing process conforms to the ISO 9001:2015 certified quality management system. To ensure continued customers’ satisfaction, we strive to meet the highest quality standards and continuously work on improving both our products and manufacturing process. The most important factor in ELISA performance is the quality of the antibody pair that is used for biomarker detection. We pride ourselves on selecting high quality, high specificity antibody pairs with mapped binding sites. All our assays are optimized to work in the biologically relevant range and can quantify biomarker concentrations in samples from healthy and diseased individuals. To optimize ELISA sensitivity and specificity, we test several monoclonal and polyclonal antibodies before choosing an antibody pair. Antibodies are always highly pure and are preferentially produced by our partner The Antibody Lab using their patented BestCellTM expression system. 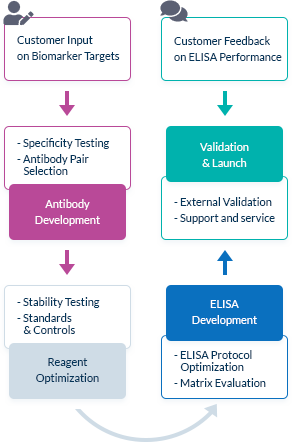 During the antibody selection process, we choose our antibody pairs based on antigen-antibody affinity kinetics and additional performance data, allowing us to be confident in our antibodies’ high quality. Determination of affinity and kinetics of a monoclonal antibody by Biolayer Interferometry (Octet, ForteBio) utilized in one of the Biomedica ELISA kits. We are frequently interested in measuring only bioactive or uncomplexed forms of a biomarker. Since we map the binding sites of our antibodies, we can choose antibody pairs that do not interfere with each other’s binding and specifically recognize, for instance, the bioactive forms of target molecules. Microarray analysis (Pepperprint GmbH) for mapping of antibody binding sites for a polyclonal Periostin antibody. Since we want to guarantee the performance of our assays in clinical samples, we make sure that our assays can quantify biomarkers in samples from both apparently healthy and pathological samples. Ranges for both cohorts are provided in the validation report of our assays. Example of C-terminal FGF23 measurements in samples from apparently healthy individuals (n=30) and chronic renal insufficiency patients (n=38). The US Food and Drug Administration (FDA), European Medicines Agency (EMEA) and the International Conference on Harmonisation of Technical Requirements for Registration of Pharmaceuticals for Human Use (ICH) are the combined regulatory forces who issue regarding internationally recognized, technical guidelines for the validation of bioanalytical methods. Their main objective is the demonstration of reliability of a test for the determination of an analyte concentration in a specific biological matrix, such as serum, plasma, or urine. Biological samples such as serum or plasma contain a variety of molecules that may interfere with analyte quantification. We use accuracy experiments to exclude the possibility that analyte measurements are compromised by matrix effects. To determine accuracy, all validated sample types are spiked with known amounts of recombinant analyte. These samples are analysed against the calibration curve of the assay, and the concentrations obtained are compared with the nominal value. Although FDA guidelines state that accuracy should be within 20% of the nominal concentrations, Biomedica goes one step further and requires all kits to be within 15% of the nominal value. Taking dilution factors into account, ELISAs should always measure the same final analyte concentration of a sample across a range of serial dilutions. This is known as dilution linearity, also referred to as parallelism. Dilution linearity can be compromised if factors in the sample matrix interfere with the binding of the analyte to the assay’s antibodies. To exclude the possibility of such interference, we demonstrate linearity by diluting samples containing endogenous analyte and blank matrix samples spiked with recombinant protein. Also, samples containing high concentrations of endogenous analyte are serially diluted. Repeated measurements of each dilution allow the calculation of the average recovery, which should be within ± 20% of the nominal concentration across the dilution range. Dilution linearity is assessed independently in several sample matrices. Dilution linearity (parallelism) of samples containing endogenous and recombinant NRP-1. The Biomedica development team carefully selects antibodies based on their ability to bind to the analyte of interest exclusively. A good antibody will specifically recognize its target analyte without cross-reacting with related molecules. A lack of specificity or an excess of cross-reactivity results in the measurements of false positives and misinterpretation. Specificity experiments determine whether an antibody recognizes the target analyte. These tests are designed to further characterize the antibody-antigen interaction, for instance by mapping epitopes, and to establish which analyte isoforms or subforms are bound by the antibody, if several are present in circulation. In a next step, we test potential cross-reactivity by adding increasing concentrations of “related molecules”, i.e. structurally similar or homologous molecules, to samples containing known concentrations of the analyte. If a homologous molecule can interfere in antigen-antibody interactions, the measured analyte concentration will diverge from the nominal analyte concentration. Hence, the accuracy of the measurement of this mixed sample is a measure for the specificity of the assay and should be within 25% of the nominal value. Example of an antibody recognizing all three isoforms of the target analyte on a Western blot. The sensitivity of an assay is the minimum detectable concentration of the analyte that can be statistically distinguished from zero. It is both dependent on the Lower Limit of Quantification (LLOQ) and the Limit of Detection (LOD). The LLOQ is the lowest point at which the analyte of interest can be accurately measured. At this point results are obtained with at least a backfit of 75-125% and a coefficient of variation (CV) of less than 25%. By contrast, the LOD describes the lowest concentration, which can be distinguished from the background signal with a 99% confidence level. Together, the LOD and LLOQ constitute the lower detection limits of our ELISAs and define the point at which measurements can be distinguished from background noise. The better the sensitivity of an assay, the lower the working range of the assay will be. Biomedica ELISAs are optimized to minimize background signal while maximizing signals from analyte measurements and sensitivity. Precision, also called reproducibility, describes the closeness of repeated individual measurements. Reproducibility of measurements is extremely important to (a) determine whether cohorts differ from one another and (b) guarantee that results remain accurate throughout larger studies. To test the precision of an assay, we measure samples of known concentrations several times with one kit lot (within-run precision) and with two different kit lots (in-between run precision). Precision is expressed as the CV of the mean value and should not exceed 20% across the range of the standard curve except for the LLOQ, at which the CV should not exceed 25%. Accurate quantification is dependent on the linearity and reproducibility of the standard curve. We optimize our ELISAs to minimize variability between standard measurements. After back fitting, back calculated concentrations of the standards should be within 20% of the nominal value except for the LLOQ at which up to 25% deviation is permissible. Up to one standard out of six may be excluded from the analysis, provided the transformation method is not changed. The total analytical error, which is influenced by both the reproducibility and the accuracy of the measurement, must be below 30%. Example of a standard curve for the FGF23 ELISA after 4PL transformation. The error bars reflect the variability of the measurement. 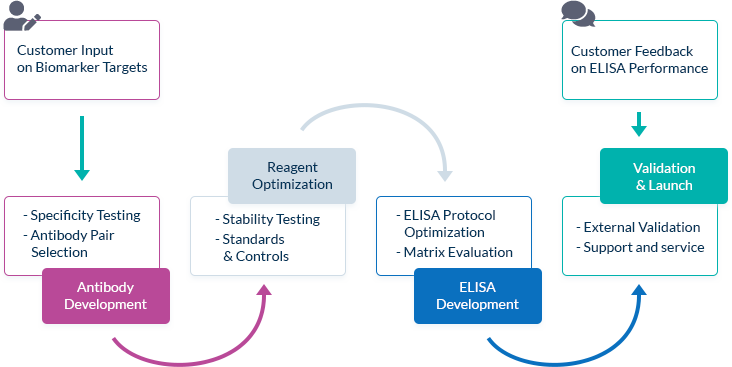 Since ELISAs rely on biological molecules for their measurements and calibration, we take measures to ensure the stability of all component substances. During development, the stability of all assay components is tested. We also expose real samples to multiple freeze-thaw cycles and leave samples at room temperature for 24 hours to determine sample stability after temperature stress. Stability of Periostin in clinical samples after multiple freeze-thaw cycles in different sample matrices. F/T: freeze-thaw cycle. Reference: freshly prepared sample. All validation reports are available for download on the individual Biomedica ELISA product pages. All kits undergo a stringent quality control process, which includes the testing of lot-to-lot consistency, kit stability during shelf-life, spike recovery and dilution linearity as well as quality control of all reagents and produced components. Biomedica’s ELISA manufacturing process complies with the internationally recognized and externally validated ISO 9001:2015 management system standards and conform to GMP/GLP guidelines. We test each new ELISA lot extensively before release. Example of a standard curve evaluation showing the increase of relative intensity over the standard curve for 9 lots of sRANKL ELISA manufactured over 3 years. All lots are extensively tested to ensure lot-to-lot consistency. The same samples are analyzed for each new lot and compared to previous lots. An example of IC trending showing the quotient of the proANP concentration measured in Internal Controls (IC) in 3 different proANP ELISA lots compared with previously established median concentrations. We are qualified, knowledgeable and experienced customer service representatives with doctorates in the biomedical fields and hands-on research experience. Although performance issues are very rare, we always aim to resolve all issues swiftly and effectively, frequently with direct input from the Biomedica development and manufacturing team. We are here to help you, be it with a technical issue, to provide additional guidance on the use of our products or because you require a custom solution for your research question. Our ELISAs are developed to serve your needs. Therefore, we both select our biomarkers based on your input and adapt our protocols according to your feedback. Before we launch any new ELISAs, selected customers test all products to ensure that the ELISAs give reliable and reproducible results outside our facilities. We aim to work together with you every step of the way.